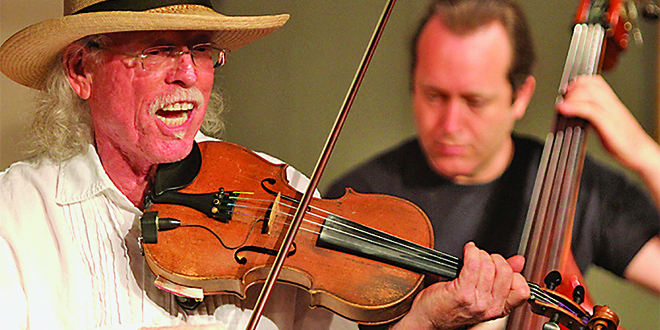 The Florida Fiddler Show features JRobert Houghtaling and his son Martin. It’s hard to say whether JRobert Houghtaling’s Florida Fiddler Show is storytelling interspersed with music or music interspersed with storytelling. But one thing is certain—JRobert totally entertained the sold-out crowd at the Marco Players’ theatre on Saturday, March 11. The show is part of the Marco Players’ Lunchbox Series that includes a box lunch and question and answer session following the performance. JRobert had the audience eating out of his hands long before the lunch arrived. Marco Players’ Board of Directors President Beverly Dahlstrom knows she has a hit on her hands. “We’re very happy to have JRobert partnering with us,” Dahlstrom said. JRobert is a fourth generation Floridian who has entertained audiences on Marco Island since catching on at the Marriott in 1986. During the Florida Fiddler Show he calls upon the people skills he honed at the Marriott and at countless gigs at the Snook Inn and the Little Bar over the years. He knows how to entertain tourists and locals alike. But don’t think entertaining a Marco crowd is old hat to him. He admitted to being nervous just before going onstage with his fiddler show. The nervousness may have shown during the early minutes of the show as Houghtaling’s clever remarks were met with scattered chuckles and his musical interludes started to warm up the audience. About a quarter of the way through his performance, though, Houghtaling was in a zone and the audience was totally engaged—and they stayed that way until he finished with his trademark Florida Fiddler song. Judging by the crowd’s reaction, they would have loved it. “Is it anybody’s birthday out there?” Houghtaling asks. No one reacts. “Rats. Oh well, it happens to be mine,” Houghtaling said, sending the already worked-up audience into a frenzy. “I’m 67 today and don’t feel a day over 66.” The audience erupts in laughter and applause and the Florida Fiddler is feeding off of their energy. Hopalong Cassidy?” A lady in the back shouts, “How about the Cisco Kid?” And the party continues. “Boy I’ve got these guys rollin’,” Houghtaling says. 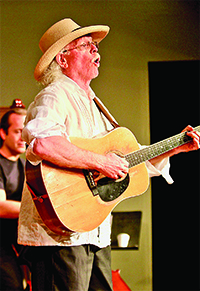 Houghtaling intersperses original songs with classic songs from the past 100 years, using his fiddle, a 1967 Martin guitar, a steel guitar and a mandolin. Even a little yodeling. And the crowd is lapping it all up. Then it’s time for an original. At the end of his set Houghtaling said, “Well, we better wrap things up.” The crowd moaned. He reassured them. “There’ll be more shows,” he promised. Then asked, “How many of you folks flew down from way up north?” After a majority of the crowd raised their hand, he joked around about air travel before introducing his second-to-last song. But just as he thought he was finished, Houghtaling’s son Martin, who ably accompanies his father on an upright bass, reminded him about the real finale. “This is one I forgot,” Houghtaling said, “The Fiddler’s Lullaby. On this Saturday afternoon, he certainly was not the only one.